With wedding season headed into full swing, are your Chiavari chairs ready? We offer a few tips on how to prepare your Chiavari chairs for wedding season. To have stock of your stock-Inspect all of your chairs. Separate them into groups such as those, need minor repairs, major repairs and no repairs. Touch Up and Tighten – Minor repairs such as loose joints and nicks or chips are easy to fix. Use touch up paint to cover smaller blemishes and tighten any loose bolts to remedy the dreaded wobbles. 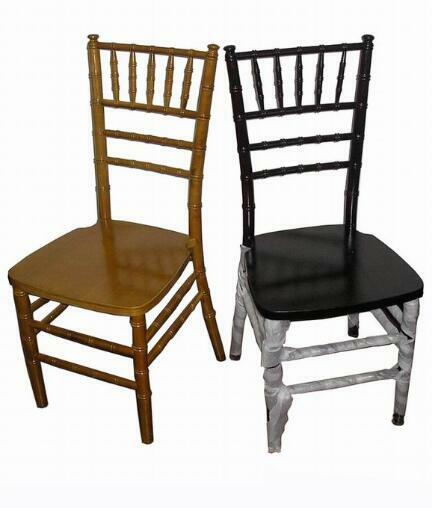 These problems are avoidable if you are invest in Chiavari Chair Company's, Resin Steel-Core Chiavari or the Chair Resin. There are no bolts to come loose and no paint to chip. Save or Trash – for more severe damage like deep gouges or broken legs and supports you have to weigh the cost of repair versus replacement. Filling in major gouges, sanding and repainting a chair can get expensive and is time-consuming. Replacement parts can also get costly and are not always easy to find. If you do decide to replace chairs, save a few for replacement parts. Having a full supply of Chiavari chairs for wedding season can be the difference between a and a great year.